Few road trips take you past spectacular 14,000-footpeaks, soothing hot springs and fantastic historical towns like this Colorado loop. Start in Denver to sample the city&apos;s thriving art and food scene. Then head to the vibrant university city of Boulder and nearby Eldorado Canyon State Park. Next stops are Lyons, Estes Park and then Rocky Mountain National Park where wildlife and incredible hikes await. From there head west to the charming town of Grand Lake, which sits at the park&apos;s West Entrance, before heading to Glenwood Springs to soak in the town&apos;s legendary hot springs. Continue west to the awe-inspiring red-rock landscapes of Colorado National Monument in Grand Junction. From there, experience incredible alpine scenery and swaths of agricultural land as you travel south through Montrose and the majestic Black Canyon of the Gunnison National Park. Farther south, you&apos;ll discover ancient history in Mesa Verde National Park and authentic towns like Durango, South Fork and Alamosa along the way to Great Sand Dunes National Park and Preserve. Union Station in Denver, Colo.
From fine art to trendy restaurants, use your feet to explore Denver. The top six things to do include enjoying a Rockies game, visiting the Denver Art Musuem, and seeing the zoo. Don&apos;t miss the We (Heart) Rocky Mountain National Park exhibit. On your way to Rocky Mountain National Park, take the path less traveled to, Eldorado Canyon State Park, one of 41 stunning Colorado state parks. As you hike in the solitude-filled Eldorado Canyon, you may find it hard to believe you&apos;re minutes from Boulder, a thriving university town. Looking for a small historic town near Rocky Mountain National Park but far from crowds? Head to Lyons, a charming 2,000-resident artsy town with great cuisine. Here&apos;s 7 reasons to stop. 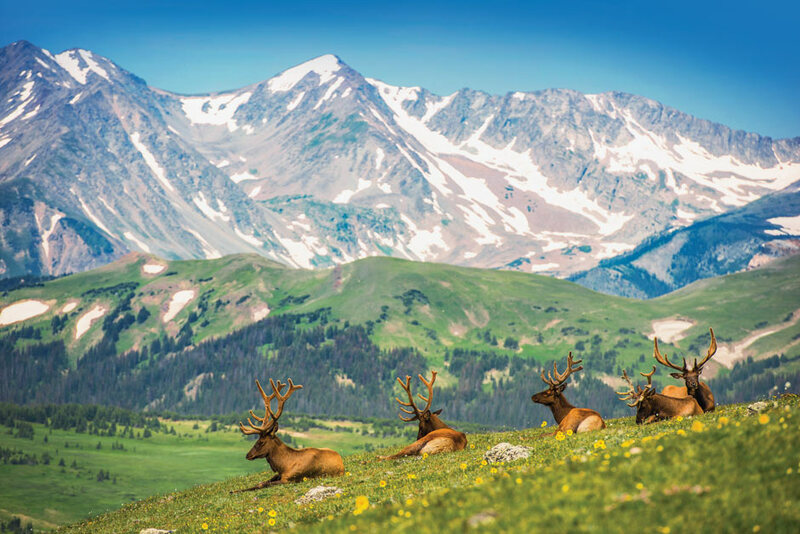 Home to herds of elk, majestic moose and Longs Peak that summits at 14,000 feet, Rocky Mountain National Park is a hiker&apos;s and wildlife-watcher&apos;s paradise. Things to Do in Rocky Mountain National Park. In the summer, you&apos;ll travel across the park on its highest road, Trail Ridge Road. The road is closed in winter due to snow, at which time visitors travel south of the park to reach Grand Lake, the park&apos;s western gateway town. Choose between the Estes Park Center on the park&apos;s east side or Snow Mountain Ranch on the west side for great activities and lodging options. Download the Rocky Mountain National Park tour app that’s like listening to a tour guide in your car. GyPSy Guide automatically plays interesting and entertaining commentary as you go. Looking to escape the crowds after you visit Rocky Mountain National Park? Head to State Forest State Park in Walden, Colo., an hour and 30 minutes from Grand Lake. Alpine lakes, magnificent peaks and a mixture of yurt and cabin rentals await. Along the way, keep your eyes peeled for moose. The North Park area is considered Colorado’s "moose capital." Don&apos;t miss these top sights in one of Colorado&apos;s most authentic modern cowboy towns on the way to Rocky Mountain National Park. Here are four ways to relax in Steamboat Springs: Hike to a waterfall, soak in hot springs, take an iconic selfie, and explore the riverside downtown while tubers float by. Strawberry Park in Steamboat Springs is just one of our nine favorite hot springs in Colorado. Here&apos;s the complete list to explore on this trip. On the central edge of Colorado sits Colorado National Monument, a spectacular, crumbling stretch of land filled with decaying red rock and deep canyons. Few know there’s a wine scene in Grand Junction and nearby Palisade, and while there are a number of national chain hotels to choose from here, the Holiday Inn Grand Junction can arrange wine tasting opportunities provided by Two Rivers Winery. Only have 48 hours to explore Mesa Verde National Park? Stick to our detailed itinerary to hit all the most important stops. There&apos;s more to do beyond the main attraction of touring ancient cliff ruins. Take a hike, gaze from a fire tower or have dinner with a view. Twelve miles from Mesa Verde, this national monument often falls off travelers&apos; radar screens, making it a fantastic place to discover solitude and ancient history. You&apos;ll find a mix of hip restaurants and Old West charm in Durango. In its heart is the Durango & Silverton Narrow Gauge Railroad which attracts 200,000 passengers per year. Mountain Biking near South Fork, Colo.
Don’t let this sleepy town tucked into the folds of the mountains fool you. South Fork&apos;s small size is counteracted by the extraordinary amount of energy its 350 year-round residents generate through outdoor recreation. It’s hard to understand this park&apos;s scale. But don’t be daunted—we asked professional photographer Andre Costantini where to approach the dunes for the best photos. From Bigfoot sightings to summiting a 14,000-foot-peak by car, Colorado Springs is a place to spend several days. The bonus? Many of our favorite attractions are free. See more wildlife by making your way from Denver to a lake park home to thousands of birds and an animal sanctuary on this short side trip. In Brighton, you’ll find bald eagles, a nationally recognized barbeque competition and a brewery housed in a refurbished Tibetan temple. Here&apos;s why Brighton is a stop worth making. See nearly 300 lions, tigers, grizzly bears, wolves, and other rescued large carnivores as they roam freely on the rolling plains of Colorado. Stunning landscapes, culture and adobe villages await on this 2,121-mile trips starting in El Paso, Texas. See multiple parks in both Colo. and N.M.
Wildlife and natural wonders await on this 1,763-mile journey through cowboy towns and three national parks, Rocky Mountain, Yellowstone, and Grand Teton. Explore some of the country's most amazing red-rock landscapes and soaring granite peaks on this 1,140-mile tour including 6 national park sites. Go from guided hiking in Rocky Mountain National Park to sandboarding the drifts in Great Sand Dunes National Park, with stops for hot springs, lakes and river rafting. Grand Lake, Colo. is located just one mile from the West Entrance of the Park and is home to the largest and deepest natural alpine lake in the state. 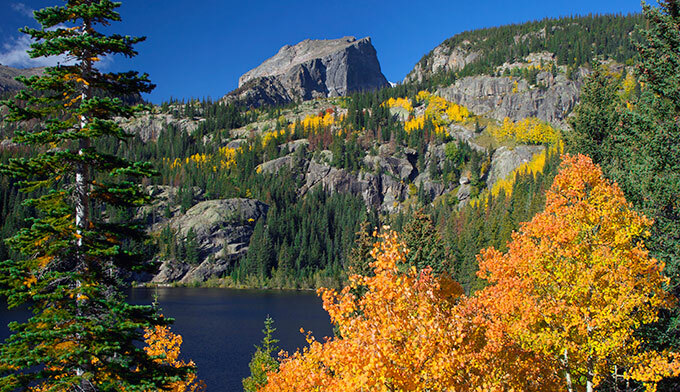 Get to Rocky Mountain National Park by train, then bus or taxi. The closest Amtrak train is in Granby, CO, 20 miles from the park's west entrance.